Ha Noi (Viet Nam), 22 June 2016 – The Special Representative of the United Nations Secretary-General on Violence against Children, Marta Santos Pais, has concluded a three day visit to Viet Nam, welcoming significant developments and calling on the government, civil society and all stakeholders for strong collaboration and action to eliminate violence against children. As in other parts of the world, in Viet Nam children are vulnerable to neglect, abuse and violence at the home; to the persistence of cross-border trafficking, sexual exploitation and child labour; to the overuse of detention of child offenders; and to the increasing threat of online abuse. “I’m very impressed by the work and the commitment of the government and civil society to protect children in Viet Nam” said Santos Pais. “The recently adopted Child Law, the important national programmes on child protection, prevention of child labour and human trafficking, and the strengthening of the network of social workers, supported by human and financial resources will pave the way for a strong collaboration, where everyone can play a key role to transform this law into action towards the elimination of violence against children, including the most forgotten such as children with disabilities and children involved with the justice system. Violence against children compromises children’s rights and has high financial costs for society through its long-lasting impact on child development, and for the budgets of the health, social welfare and criminal justice systems. By investing in prevention we strengthen Viet Nam’s human and social capital”, Santos Pais stressed in her meetings with the government. During her visit she met Deputy Prime Minister Vu Duc Dam and highlighted progress made, including the recent ratification of the UN Convention on the Rights of Persons with Disabilities, the adoption of the Child Law, and the creation of the Family and Juvenile Courts. She called on the government to take all steps to ensure that in line with the UN Convention on the Rights of the Child, all children between 16 and 18 years of age are fully protected. SRSG Santos Pais also travelled to the city of Da Nang to visit UNICEF-supported Social Work Center where she engaged with professional social workers, volunteers and children on their thoughts about what violence against children means, what can be done to prevent it and who can support these efforts. She discussed with local authorities in Da Nang about city policies and programmes to strengthen the child protection and social welfare systems to prevent and address violence against children within the framework of Da Nang’s plan to become a child-friendly city. 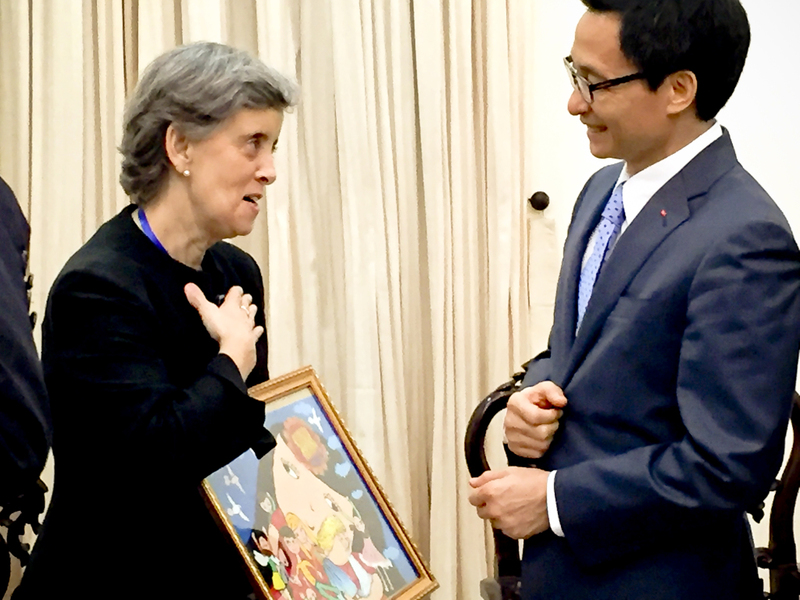 In her meetings with the UN Country Team in Viet Nam, Santos Pais welcomed the priority given to preventing and responding to violence against children. The new One UN Strategic Plan 2017-2021 commits to supporting the government in its efforts to end all forms of violence against children, including by strengthening the national child protection system, changing perceptions and attitudes of society towards violence against children, and to encourage children and the wider population to speak out when they witness such violence. At a consultation with civil society and non-governmental organizations in Ha Noi, co-chaired with UNICEF and the Viet Nam Association for the Protection of Children’s Rights, participants shared their concerns about the widespread use of violence against children in society. The organizations attending expressed their commitment to be child rights advocates, to change people’s perception and attitude in order to achieve a common goal of zero violence against children. “Change starts with each of us. We can promote non-violent approaches to child rearing so that parents feel empowered to raise their children in a positive and caring environment without violence, schools are truly safe learning environments, and institutions prevent and address any incident of abuse”, highlighted Santos Pais. During her visit Santos Pais was a keynote speaker at the 4th ASEAN Children Forum in Ha Noi and met senior officials from ASEAN member states, and the ASEAN Commission on the Promotion and Protection of the Rights of Women and Children (ACWC) and regional civil society organizations. In her dialogue with the child delegates and inspired by their reflections and recommendations, she highlighted the importance of listening to children and benefiting from their views on how to prevent and respond to violence that affects them at home, at school, on-line and in the society in general. Santos Pais participated in the closing session of the Children’s Forum where children presented their recommendations for ending violence against children to the senior officials. The new ASEAN Regional Plan of Action to Eliminate Violence against Children identifies key priority action for the protection of children which can be supported by the children’s views and recommendations.